Garlic is a very popular equine feed supplement, whether it’s added to the diet to help support respiratory health, for general health or even to help repel flies and biting insects in the warmer months. At Equimins, we have a variety of garlic supplements, to suit your feeding style and the kind of product you prefer to use. In our range we have Garlic Powder – it’s available in 500g, 1kg, 3kg, 5kg and 10kg quantities. The serving suggestion is 20g per day for the average horse. Garlic Granules – which are available in 500g, 900g, 1kg, 3kg, 5kg, 10kg and 15kg quantities. 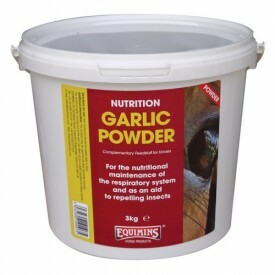 With a feeding suggestion of around 20g per day, this is a very economical way to feed garlic. Golden Garlic Flakes – which are available in 1kg and 2.5kg bags. Liquid Gold which is a garlic extract in liquid form. 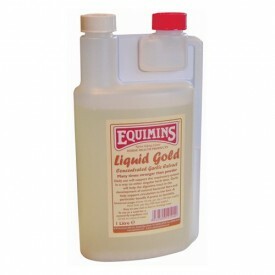 With a feeding suggestion of 10ml per day, a 1L bottle will last the average horse 100 days. A number of our supplements also contain garlic as an ingredient. These include Air Way, Air Way Liquid, Itchless, Respiratory Formula and Gut Health. To see our full range of products, just visit the website.